Shoulder blade pain is a common problem. There may be a problem in the shoulder blade itself or the surrounding soft tissues, or the pain may be referred from somewhere else such as the neck or lungs. It may be caused by a minor problem such as a muscle strain or simply having slept awkwardly or something serious such as cancer or a heart problem. So how do you tell the difference? Let’s start by having a look at the anatomy of the shoulder blades and then we’ll go on to look at the most common causes of pain in the shoulder blade area so you can work out whether there's a problem with the bones, soft tissues, nerves, an underlying medical problem or it's just down to poor posture. Eighteen different muscles attach to different parts of the shoulder blade, and each scapula can move up and down (elevation and depression), forwards and backwards (protraction and retraction) and can twist (upward and downward rotation). Let’s look at each one in more depth. Overuse or over stretching of muscles can cause pain in the shoulder blade area. This usually develops due to overworking the muscles, most commonly from a new exercise regime, repetitive overhead arm activities like throwing, lifting or carrying something heavy like a backpack, or even sleeping awkwardly. 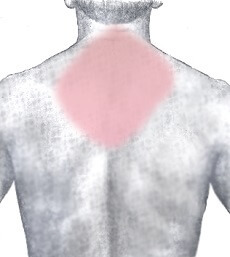 There tends to be a dull ache around one or both shoulder blades that gets worse with activity and eases with rest, and the area may be tender to touch. Symptoms don’t usually refer into the arm. The rotator cuff is a group of muscles that work together to move the shoulder joint. If one of them is torn, usually from prolonged repetitive arm work or an injury, there will most likely be pain around the shoulder which may refer down the arm and to the shoulder blade region, but only on one side. 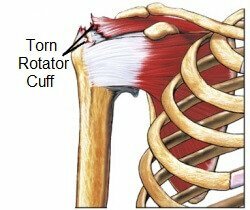 Find out more about symptoms, causes and treatment options in the Rotator Cuff Tear section. Trigger points are small, tight bands in the muscle fascia which can be extremely sensitive to any touch. They are commonly found and cause pain in the shoulder blade area, usually described as a dull, deep, aching pain which may extend down on arm. It is fairly common for shoulder blade pain to originate from irritation of the nerves that come from the neck or upper back. These nerves commonly refer pain to the shoulder blade area and may be accompanied by tingling, pins and needles, numbness and/or weakness. Your spinal cord runs down the centre of the spine, with nerves branching out at each spinal level which extend out like flexible wires. Signals run up and down the nerves to and from the spinal cord and brain controlling movement and sensation (touch). 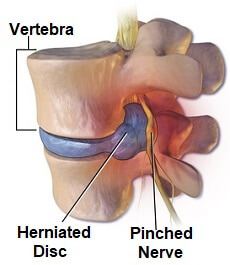 a) Disc Protrusion: aka herniation or slipped disc. This is when a tear develops in the outer layer of the disc (the edge of the donut). As a result the central part of the disc known as the nucleus (think of it like the jam in the donut) bulges out of the disc. In severe cases it may even seep out, known as herniation. Both can place pressure on the nerve resulting in irritation. In most cases, this is a gradual process, but it can be caused by an injury such as heavy lifting. There is often an unhelpful misconception that the discs slip in and out of place, but that is actually impossible as they are held tightly in place. The discs can be stretched, squeezed and twisted, but they do not “slip”. The term slipped disc refers to the movement of the nucleus of the disc (the jam), not the disc itself. b) Disc Degeneration: As we age, the disc starts to dehydrate, weakens, thins and essentially shrinks. This decreases the space between the vertebrae (which explains why we shrink as we age) which can place pressure on the nerves, and increases the risk of disc protrusion. This is when there is abnormal narrowing of the spinal canal (the space in the middle of the vertebra through which the spinal cord passes). Spinal stenosis may be caused by ageing, arthritis, spinal instability, trauma or may be hereditary. Symptoms tend to be at their worst when standing and include shoulder, arm, hand and shoulder blade pain, numbness, weakness, balance problems and in severe cases can affect bladder and bowel function. In most cases, symptoms are bilateral (on both sides). 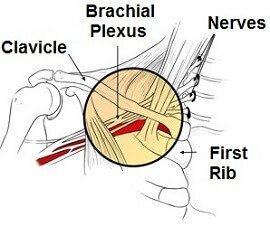 Brachial Neuritis is a rare condition where there is inflammation of the brachial plexus, an area where the nerves from the bottom of the neck pass across the front of the chest. It may develop due to genetics or an abnormality in the immune system. Symptoms usually develop suddenly, most commonly at night. The initial symptom tends to be shoulder, neck, arm and shoulder blade pain, which gets worse with any arm movement, and after a few days/weeks, weakness develops which can lead to scapula winging, making it hard to move the arm normally. Sensation may also be affected with tinging or numbness. There tends to be little respite from symptoms and the pain may only respond to strong painkillers. Find out more about symptoms, causes and treatment options in the Brachial Neuritis section. T4 syndrome is a rare condition that results in a complex pattern of painful symptoms including shoulder blade pain. The thoracic spine forms the middle and upper back area, starting just below the neck. There are 12 thoracic bones (vertebra). T4 syndrome typically refers to damage or irritation around the fourth thoracic vertebra, although the problem may come from anywhere between T2-T7. Symptoms usually affect one arm, but can sometimes affect both, and tend to include diffuse (meaning it’s hard to pinpoint where the pain is coming from) arm, neck and shoulder blade pain, tingling/pins and needles/numbness, stiffness, muscle spasms and headaches. Pain often gets worse when pressure is applied directly to the T4 vertebra. Symptoms tend to worse at night and are exacerbated by any movements of the upper and middle back such as twisting, bending, laughing, coughing and activities such as driving where the arms are reaching forwards and lifting. T4 syndrome is thought to be caused by factors such as stiffness, hypermobility, poor posture, repetitive bending/heavy lifting. Around the shoulder blade there are a number of bursa, small, fluid-filled sacs that sit between soft tissues and bone to allow smooth, friction-free movement. Sitting on the front of the scapula is a large muscle called subscapularis. There are two bursa, one near the top of the scapula and one at the bottom that allow the scapula to glide smoothly over the ribcage. 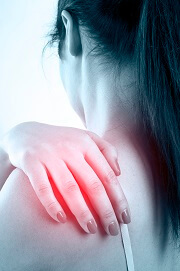 Inflammation of the bursa, due to factors such as muscle weakness or tightness, poor posture or bony abnormalities can result in a persistent, dull, aching shoulder blade pain and a snapping/grating noise with arm movements. There may also be a lump on the shoulder blade. 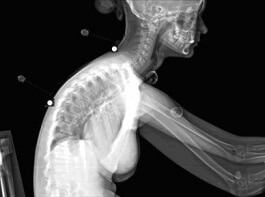 Find out more about symptoms, causes and treatment options in the Snapping Scapula section. Poor posture can also lead to shoulder blade pain. In a world where we tend to spend lots of time hunched over at a desk, computer, sink or in the garden, poor posture is a common problem. Shoulders round forwards, the chin protrudes, chest and upper back muscles get weak and areas of the spine stiffen, particularly the lower neck and upper back which can lead to aching shoulder blade pain, particularly across the upper back in between the shoulder blades. 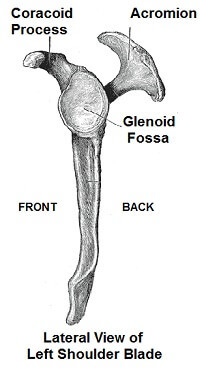 The shoulder blades are amongst the most difficult bones in the body to break, so fractures here are very rare. It is basically impossible to break your shoulder blade without knowing about it, and it most commonly occurs due to a fall, collision or a motor vehicle accident. Scapular fractures are often accompanied by other injuries which may be serious such as rib fractures and lung injuries. Find out more scapular fractures including the causes, symptoms and treatment options in the shoulder fractures section. Organ disorders can often cause referred shoulder blade pain. They will usually have other accompanying symptoms as well, so if your only complaint is pain in the shoulder blade area, it is unlikely to be caused by any of these. People typically think of heart problems being associated with chest pain and left arm pain, but shoulder blade pain is often a reported symptoms with heart problems, particularly in women. The most common heart problem that causes pain in the shoulder blade area is a heart attack, where there is decreased blood flow to the heart either due to a clot or bleeding. Other heart problems that can cause shoulder blade pain include pericarditis (inflammation of the lining of the heart), and aortic dissection (a tear in the aorta, the main artery that carries blood away from the heart). If your chest and/or shoulder blade pain are severe, come on suddenly, are accompanied by dizziness, shortness of breath, rapid pulse, sweating, chest tightness or nausea, call 911 immediately. Heart problems are often a medical emergency – seek treatment immediately. Some types of cancer spread to the bone known as metastases. Cancers that typically spread to the scapula causing shoulder blade pain include breast cancer, lung cancer, colon cancer and oesophageal cancer. Shoulder blade pain from metastases is usually worse at night and will be accompanied by fatigue, weight loss, nausea and lack of appetite. Problems in the abdominal organs can result in referred shoulder blade pain. Left shoulder blade pain may be caused by pancreatitis or irritable bowel syndrome (IBS) and right shoulder blade pain may be due to gallstones, peptic ulcers and liver disease such as liver cancer.